Windows Plus is the company to turn to if you’d like to refresh the entranceway of your home with gorgeous new front doors. We are committed to helping homeowners throughout Louisville, Kentucky, and southern Indiana improve their homes with some of the finest products on the market, which is why we install doors from ProVia, a leading manufacturer in the industry. Fiberglass or steel materials – Fiberglass is one of the more durable materials on the market and will hold strong for years. But, if you want the ultimate in strength and security, our steel doors won’t let you down. Color and finish – With a plethora of choices, you’ll be able to give your home’s façade the new look you’ve always wanted. 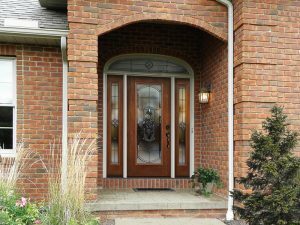 Glass options – From privacy and hand-stained glass to decorative grids and between-the-glass blinds, we can customize the glass in your front doors in myriad ways. Sidelites – We can frame your doors with beautiful sidelites to allow natural sunlight into your home. Hardware and accessories – Put the finishing touch on your new doors with stylish doorknobs, rustic clavos, and other add-ons. All of the doors that Windows Plus installs offer some kind of energy efficiency, but if this is a priority benefit for your home in the Louisville, KY, area, we recommend ProVia’s Embarq collection. These front doors contain a number of insulating features to minimize heat transfer, which can translate to lower monthly energy bills. No matter how you design your new front doors, you can count on long-lasting performance backed by a lifetime warranty. To learn more, contact Windows Plus today. We proudly serve homeowners in Louisville and throughout Kentuckiana. Are You Ready for New Doors?